A Frenchman named Louis Moire was working as a bicycle salesman not long before World War Two. An astute observer of commerce, Moire surveyed the commercial landscape of his chosen profession and decided what its customers needed were affordable cyclotouring bicycles – something capable of competing with the great constructeurs like Maury and Pitard, just less on quality and more on price. Something giving the customer more “boum!” for the franc. A bargain, in other words. Never one for disregarding marketing, Moire named his company “Goëland,” French for “seagull,” a pleasant, inviting image for a bike assembled and sold at 44 Rue Etienne Marcel in Paris, imminently landlocked and hours from the nearest seashore. But the bicycles that came out of his little shop were perhaps more special than anyone accustomed to the contemporary purchasing experience of mainstream bicycles might ever expect. One may be excused for thinking value-based marketing is a modern phenomenon, awash as today is in a sea of commercialism, with ads constantly hammering away at the alleged cheapness of the product they promote rather than its functionality or fineness. Products like instant energy fruit gels are touted as healthy, easier alternatives – there is still fruit in those things, right? Shoes that miraculously disassemble themselves in six months time are now celebrated, as are cycling jerseys seemingly tailored for one-time use in wind tunnels, and hubs whose bearings have a higher coefficient of friction than two flat 650B tires, and on. It amounts to an all-enveloping tsunami of tasteless shoddiness whose overwhelming virtue is cheapness. Indeed some have become so habituated to the concept of goods made to be sold — rather than used — that shopping (instead of doing something with the things they buy) has gained a high ranking in surveys of recreational preferences of denizens of the modern United States. Generally, one does not find this near absolute subservience to numerical price in Western Europe. Denizens of those places have an affection for their lives that is difficult for others to comprehend, tending to actually use the things they buy to make their lives better. Yes, they are happy to save a buck, or Pound or Euro – but not at the expense of a product’s rightful place in their lives. 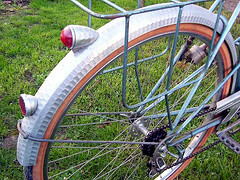 While it would be very hard finding better framebuilders in any era of the past than the lonely craftsmen scattered about the U.S. and Japan in the present, it was in France during the two decades on either side of World War Two that the “constructeur” flourished and refined the art of creating a complete bicycle to the customer’s order. A bicycle that transcended form and function alike to become an exemplar of the very art of living: a machine that lifts its rider above the mundane and ties him into the world and its fellows. René Herse, Jo Routens and Alex Singer came to distinguish themselves as among the greatest masters of this craft — that of making finished bicycles tailored not only to the buyer’s physique, but his or her lifestyle habits. And the prices they charged were accordingly high, much like the prices today’s most sought-after bicycle makers are able to charge. 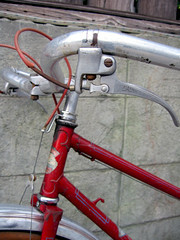 “The bike that I had and then sold was very nicely made with attention to high-quality joining methods (lugs and brass). It had no decals, or indication of Marque, (Goëland) but had some nice pinstriping. In general, I think it’s safe to say, that Mr. Moire made bikes that were in the VERY highest level. 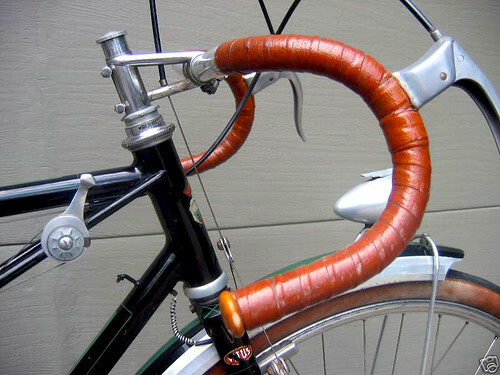 Others have noted the variation in finish quality among Moire’s frames and complete bikes, and have opined that whereas the greatest-most constructeurs preferred working always at the highest levels, Moire worked with his clients to get them on damned good bikes that would fit within their budget. If that meant sacrificing decorative details, using straight-gauge Reynolds instead of lighter double-butted stock, or mounting good but not exalted hubs and saddles, he would do it. It was still a sale, it was still a good bike, and another client with a Goëland bike between the legs was a better thing in Moire’s eyes, one supposes, than a client left to plod home on foot. The truth behind all of this is a simple one: Moire did not make his own frames, nor did he employ framebuilders inhouse for doing so. Goëland frames and forks were manufactured by various “cadreur” builders who were contracted to provide their services on a single or limited production run. While such strategies do not encourage consistency, they do enable significantly lower costs and rapid scalability. Mastery for the masses, as it were. Perhaps this a direction too long neglected in the U.S., where little middle ground exists between $2,000-and-up racing bikes or cyclotouring customs such as Rivendells and Vanillas, and the cheap spring suspended tanks filling the aisles of mall-bound department stores. Kogswell has been making some inroads into this largely unaddressed market, but few small builders are able to compete with monster brands like Trek or reborn favorites Fuji and Raleigh. By all accounts, Moire’s bikes were and are excellent long distance rides or viable working vehicles. One ought to feel a certain admiration for Moire and his allegiance to the working stiff, who may have needed a bike for his delivery job, or to satisfy a deeper desire in traveling freely about the world. Moire was in fact one of the first, according to Heine, to build a “Vélo Federal,” a cyclotouring bike made to rigorous specifications developed by the French Cyclotouring Federation in the late 1940s to provide a lower-priced alternative for the cycling masses. 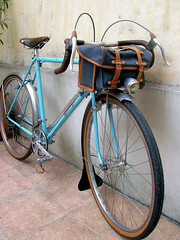 Clearly, Louis Moire was among the most committed French bicycle manufacturers to be looking out for the everyday person! Other offerings from just after World War Two included: a “Type Fédéral” (the “volkscycle” mentioned earlier), lightweight sport bikes, randonneurs, bikes for club riders, and a bike for youths. Goëland bicycles for non-racers invariably came complete with fenders, generator lighting and some sort of rack — on the porteurs, a heavy-duty front rack, and light racks for panniers on the others. 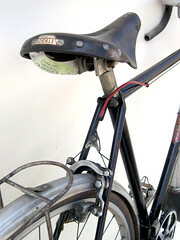 Ordinary models affixed the rack using standard mounting hardware while better ones featured racks brazed directly to the seat stays. While brands of components Moire kitted had names like Normandy and Philippe, they also had names like Idéale, JOS and Maxi-Car. Most were catalog bikes, with Goëland ads stressing they built bikes to measure “hors serie,” employing “impeccable” construction at an “approachable” price. Postwar ads focused more on high-end machines. 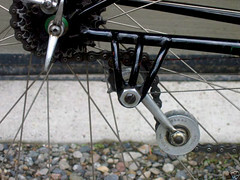 Moire contracted custom racks, designed a front derailleur used on some Goëlands for a while, and was among the first to design and sell trailers for touring cyclists. His trailers were a one-wheel design similar to many popular models still made today. After the war, Moire curiously altered the spelling of his company’s name slightly, from “Goéland” to “Goëland.” The word refers to a species of large seagull; the latter spelling being current in France today. 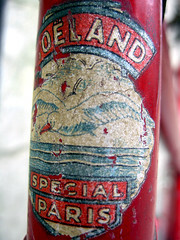 There was at that time a partial collapse of the French bicycle manufacturing industry, but Goëland and its new spelling survived until Moire’s retirement around 1970. This kind fate spared him the stress of trying to sustain a business through the chaos following the bike boom of just a few years later, after which many French (and British) bicycle manufacturers ended up properties of outside investors, eventually contracting the design and construction of their machines to Taiwan. 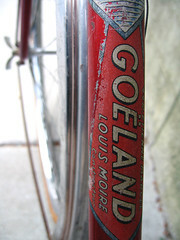 It also makes Goéland and Goëland among the longer-operating cyclotouring bicycle manufacturers ever, with a thirty five year production run starting in about 1935 and lasting until 1970. In addition to validating Moire’s commitment to quality for the masses, the company’s longevity leaves us with a few special gems who continue carrying the soaring gull high above the sea. Of the great constructeurs, only Cycles Alex Singer remains in operation, where it always has on rue Victor-Hugo in Levallois-Perret, Paris. These days workaday bikes in France are more likely to be Polish or Taiwanese hybrids or “Hollandais” cruisers than bikes of French styling. But many old porteurs, mixtes and city bikes remain from the immediate postwar era, and among these must be a few old Goëlands, still carrying folks to and from work or out into the country as they were built to, exhibiting a steadfastness and durability their modern, robot-welded relatives could only dream of. If they could dream at all.